The missions of the Apollo Program. 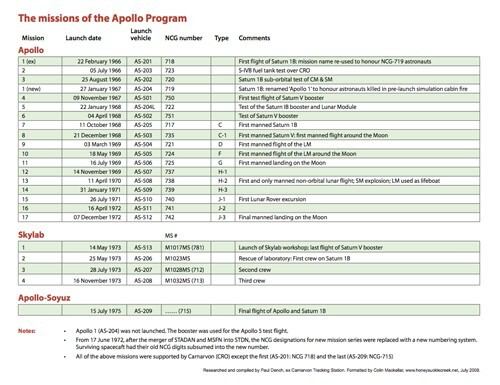 This list, compiled by Paul Dench, brings together the Apollo mission number (e.g. Apollo 8), the Launch vehicle designation (e.g. AS-503, AS being for Apollo-Saturn), and the Goddard Space Flight Center designation (e.g. NCG-735, NCG = Network Control Group). Click the image for an 80kb PDF file.